A beautiful pair of classic 1930s oak bedside cabinets with brown marble tops. They feature a single drawer and a large cupboard below with decoratively carved centre panel. 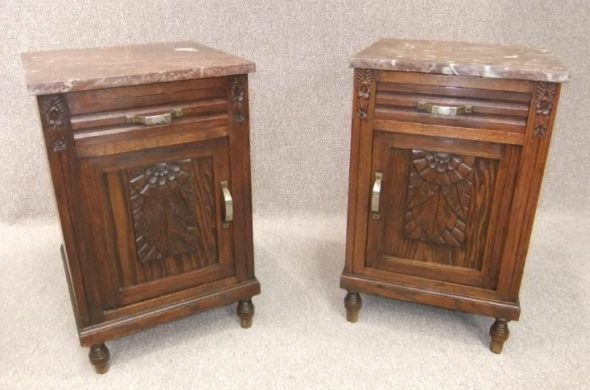 Even though these art deco bedside cabinets are 1930s, they would complement many different bedroom suites, and would finish off any period bedroom setting. They are in lovely condition for their age, with just a small amount of everyday wear and tear. This is to be expected from pieces of furniture of this age.